Two of the running jokes around the office involve me: (1) Every time I go on vacation, big Penn State news breaks and (2) Every time it’s my turn to do The Daily, there are scandal and/or legal-related updates. I was wine tasting in Sonoma when when Bill O’Brien left to coach the Houston Texans, and today, my first day back on Daily Duty, there’s so much scandal-related news that there’s barely any coverage of what’s probably the most interesting part of it—the judge’s decision in the NCAA lawsuit, released late afternoon Tuesday. I hate to be a cliche, but I guess there is a pattern. 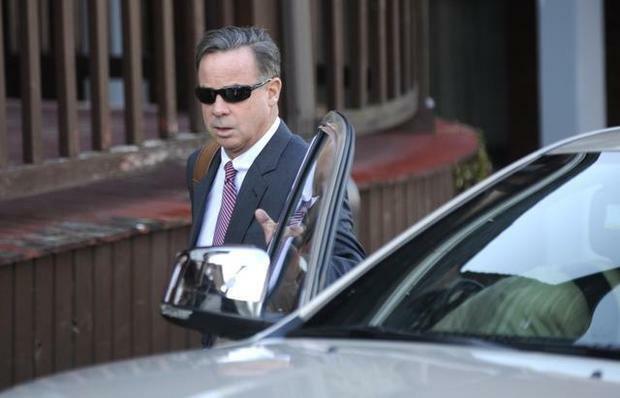 Paterno family attorney Wick Sollers arrives at the Oct. 29 hearing in this photo by Nabil K. Mark of the Centre Daily Times. Sandusky pension hearing: Jerry Sandusky ’67, ’71g testified via video link for about three hours Tuesday in an attempt to get his Penn State pension restored. He lost it because of a state law that allows for the forfeiture of pensions for people convicted of certain crimes, but he is maintaining that he was not a Penn State employee when the crimes occurred. Mike Dawson ’02, who had a really busy day, has the strongest story, which details how much of the testimony weirdly recounted Sandusky’s performance as a defensive coordinator. Spanier v. Freeh: As if that weren’t enough legal news, there was another hearing Tuesday morning about whether Graham Spanier needs to file more than an intent to sue Louis Freeh for defamation. Spanier’s attorney contends that’s enough given that the criminal case is proceeding. Freeh’s attorneys said more details about the potential lawsuit are required. No coach yet: And, yeah, the search for Penn State’s next football coach continues. The Patriot-News has a ton of coverage, ranging from an interview with Bill O’Brien’s right-hand guy, Jim Bernhardt, by Audrey Snyder ’12 to David Jones’ column on why Penn State needs stability in its next coach. For the latest rumors and hand-wringing, of course, go to Twitter. 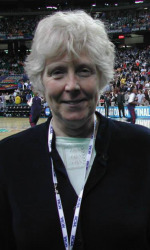 RIP Mary Jo Haverbeck: Like all of my friends and colleagues who cover Penn State sports and/or women’s sports, I’m mourning the death of Mary Jo Haverbeck ’76g, retired associate sports information director and the first woman inducted into the College Sports Information Directors of America’s Hall of Fame. Mary Jo worked behind the scenes, but she’s one of the main reasons that Penn State’s women’s sports teams became so prominent, as Centre Daily Times sports editor Walt Moody points out in a lovely tribute to Mary Jo. I’m one of the many, many people Mary Jo went out of her way to mentor, and I can’t say enough how much she taught me and what a nice person she was. I’ll try, though, in another blog post within a day or two. Entry filed under: Uncategorized. Tags: Audrey Snyder, David Jones, Mary Jo Haverbeck, Paterno family lawsuit.